Halloween in Phoenix means several things: adorable costumes, Halloween events, and festivals, and stocking your home with decorations and sweet treats for the little ones who come knocking on your door. If you plan on handing out candy, there are a few things to know about the Halloween holiday in Phoenix. Usually, there is no set schedule for trick-or-treating. In Phoenix, there is a tendency of children and parents to trick-or-treat in groups, sometimes ten or so at a time. Most trick-or-treaters will arrive at homes between 6 p.m. and 8:30 p.m., but there is no hard rule about it. Notwithstanding the fact that it is Halloween, city curfews are still enforced. If Halloween falls on a school night, it is usually a good idea to wrap things up by 8:30 p.m. or 9 p.m. at the absolute latest. If you have young children, you may want to go to a few houses while it is still light if they are afraid of the dark. If you do opt to be out trick-or-treating after dark, consider your child's safety. Make each child more visible by having them carry something that lights up, whether a glow bracelet, flashlight, or glow stick. Light-up shoes or costumes are other good ideas. 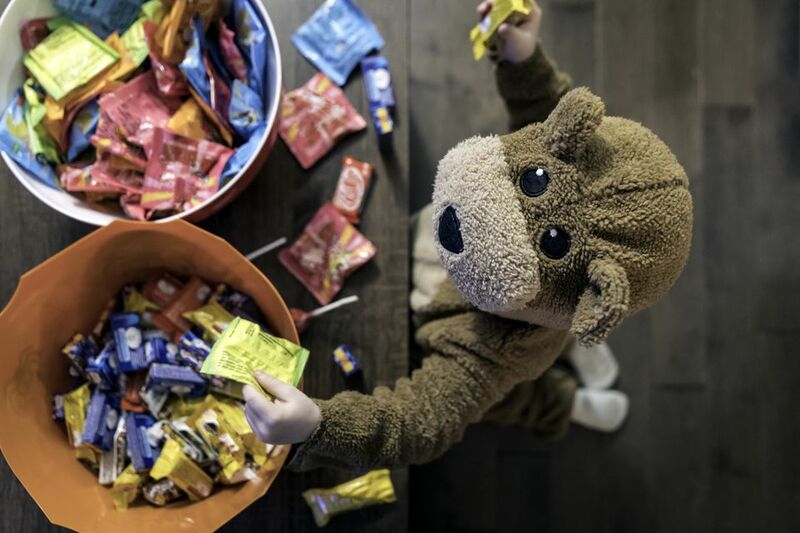 If you live in a development or private community, then your community association may have rules as to the times that trick-or-treating is allowed. If you are not sure, contact your association. Depending on your neighborhood, the number of children coming to your door can vary widely from neighborhood to neighborhood. It cannot hurt to plan for at least 100 kids unless you know there are very few in your neighborhood who come annually. In the worst case scenario, if you are left over with too much candy to polish off on your own, you can donate your candy to U.S. troops overseas or who are recuperating in hospitals. The weather in Phoenix can be tricky at the end of October. Halloween can go either way in terms of high temperatures or a more moderate temperature for the day. Since most costumes are purchased in advance, it might be best to not purchase a heavy fleece or faux fur suit for your little one. If the day is 90 degrees, you child can overheat very easily. Also, keep in mind that sometimes trick-or-treating can go on for longer than an hour. The shoes you choose for you and your kids can make all the difference between a fun time or not. Choose shoes that fit well and have been worn before. Pick costumes that will not drag on the ground and are bathroom-friendly. It is best to plan your route to accommodate at least one bathroom break along the way. If your kids are getting older, your neighborhood is too spread out, or you are just not comfortable letting the kids go door-to-door, there are a variety of places where families can go for safe Halloween fun, with candy, costume contests, games, rides, and more.